Seventy years before our story began, incidence of psionics in human specimens was somewhere around .5% of the adult population and the numbers were even lower for the Elder Races. That all changed when dozens of meteor showers were observed over the whole of the continent of Damark. Every night for two weeks the sky rained fire, producing a remarkable quantity of adamantine, but it would take a generation for the greater consequences of this event to blossom. The correlation is not clearly understood but for ten years after the Starfall, one in ten humans born demonstrated some measure of psionic talent at puberty (the numbers have since leveled off at around 5% possessing at least a wild talent, about the same chance of an individual being left-handed or having red hair). These people were colloquially known as “minders” and quickly became a force to be reckoned with: a combination of envy, superstition and outright fear galvanized the psionic population and forced them to work together. Actual violence was rare but minders decided it was time to establish themselves officially as a distinct ethnic group. This was significant because the Old Kingdom was but a dim shadow of its former glory. 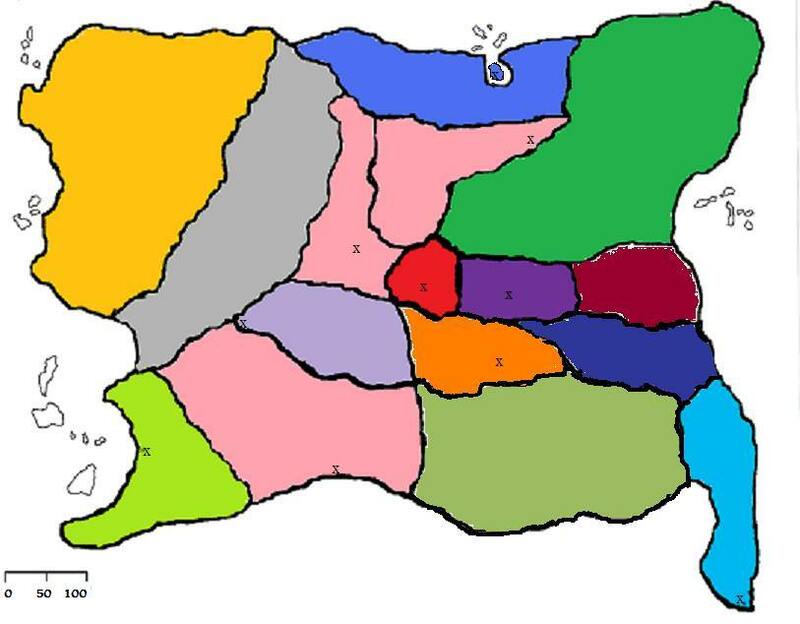 The royal court crumbled; nobles debated and schemed openly how best to carve up territory; and the ruling family, decadent and weakened from a succession of inept and unfortunate monarchs, found itself ceding more and more power to representative and regional governments. It is fair to say the Old Kingdom was a kingdom, then, in name only. The current ruler at that time, Martin the Blind, was nevertheless reluctant to recognize minders as a minority. He considered this an opportunity to reclaim some of his family’s lost honor and prestige, sensing a growing distrust and fear of this rabble (who many in the wider population perceived as mutants). King Martin’s response was swift and a gross abuse of his power: not only were the minders not acknowledged as a political force (preventing them from taking positions of power in the government at any level under the throne), all property claimed by anyone possessing psionic powers was confiscated by the Crown and anyone who protested was thrown in prison. Walled “protection centers” to house the psionic population were constructed all over the kingdom. Seized property was redistributed back to the local communities, cushioning some of the tax hikes required to fund these outrageous expenditures. Many new jobs were created, too: workers, soldiers and the “neighborhood watch” were all placed on the King’s payroll. If one needed to be elected to his office, Martin would have likely won a lifetime appointment. It should come as no surprise that approval of these social reforms was by no means unanimous. Those minders who thought better of protesting openly were forced underground, and those without psionic talent at all also faced persecution if identified as sympathizers. The Society of Freethinkers was established four years after the Reclamation (as the movement was called in loyalist propaganda) began, twenty years after the Starfall. Unlike other revolutions this one was not quiet and did not slowly lead up to armed conflict from civilized debate. Three days after the charter members established their mission statement, King Martin the Blind died mysteriously in his carriage on the way to the opening ceremony for Protection Center 04 (actually the first walled ghetto to be completed). The Mindwar had begun. The Elder Races largely stayed out of the war because it could not have had less to do with them. The dwarves and elves savagely defended their borders, the gnomes made themselves scarce and the halflings tried their best to avoid picking sides. Unthinkable atrocities were committed on both sides. Poisoned water supplies, political assassinations, sabotage, trafficking with denizens from the Lower Planes and random acts of terror were commonplace. Twelve years ago the war reached a turning point: neither side really understood why they were fighting anymore, primarily because most of the principal agents from the early days had all been killed or locked up. Queen Issra (now an old crone in her seventies), Martin’s successor, decided it was time to move on and began the process for peaceful resolution with the Society. Her son, Martin VIII unfortunately did not see it that way and smothered the queen with a pillow in her sleep. Still, as hostilities winded down and agents moved behind the scenes on both sides, the Mindwar was drawing to a close. The conflict officially ended when after two months of surging loyalist aggression, the capital city was stormed and King Martin VIII’s blood was spilled in his own throne room. With his daughter only seven months old, the royal line’s authority in the Old Kingdom was effectively broken and the Mindwar died with a whimper. The Society’s terms were simple: equality. With the monarchy broken, the six counties that once made up the kingdom were left to their own devices. The outer gates of the old capital, Castle Blackstar (during the Starfall over sixty years ago the city and the castle itself had been heavily bombarded and in fact a large meteorite still lay buried in the center of the throne room), now marked the end of royal jurisdiction; Seneschal Barnaby was appointed to rule in Queen Issra II’s stead. That was six years ago. The decaying infrastructure between cities has further deteriorated with no central power or funds to repair it. Bandits from many former walks of life prey on the weak because no troops are left to patrol the roads. Increased evil humanoid and monstrous activity has been reported in all regions of the Old Kingdom. The end of the Mindwar brought relief to a beleaguered people but exposed many new problems. Border disputes among the six new nations, once held in check by an authoritarian hand, have in some places boiled over into armed clashes. The Elder Races likewise saw opportunity in this new power vacuum to reclaim ancestral lands or carve out new kingdoms for themselves. Hostilities between minders and “norms” largely evaporated before the bloody conclusion of armed conflict. Even at the height of war the average commoner could never distinguish a psion from a sorcerer so most people have come to accept there are enough other reasons for bloodshed. The Mindwar is over. The county of Haranshire was special among the territories comprising the battlefields of the Mindwar in that it was never considered valuable territory to either side. With more than its share of monster predation, marginal resources beyond what locals need to scratch out a living, slim tactical significance to either the Society or the Crown and a ruling family who could not want less to do with military conflict, Haranshire today is much the same as it was the day before Martin the Blind instituted his “Reclamation.” Arable land is scarce and monsters threaten hunters enough to keep the local population down, but the widely varied geography supports all manner of flora and fauna. Haranshire lies east of Castle Blackstar and is the ancestral home of the Parlfray clan. Today, Lord Parlfray musters enough troops to patrol up and down the Churnett River but otherwise the rule of law is largely carried out on the municipal level by Mayor Carman in Milborne. 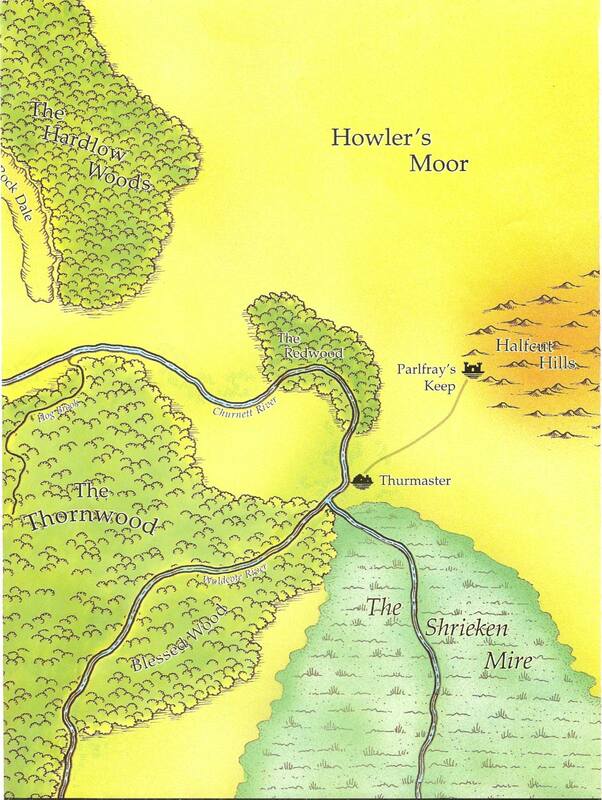 Other important geographical regions include the Thornwood, the Blanryde Hills and the Shrieken Mire. So named because its capital, Land’s End, is the southernmost point on the continent of Damark, Southspear is a single vast plateau with rich grass suitable for grazing but not enough topsoil to support agriculture. Herds of wild horses run free across the flat expanse of Southspear while hardy ranchers try to make their living raising goats and sheep. Land’s End is actually two cities with over 20,000 inhabitants total: a sprawling metropolis teetering on the edge of a 600 foot cliff, and a network of caves, tunnels and crane equipment stretching all the way to the sandy beaches below. The port’s trade goods are hauled up and lowered down using sophisticated gnomish engineering. The great machine serves to keep the pockets of the city’s ruling families lined; local politics consists of wheeling and dealing between the families in smoke filled rooms and local military forces consist of the families’ private armies. Whenever a consensus must be reached among the city’s leadership, the heads of the five wealthiest and most influential families come together to hammer out agreements. That only one of these has any blood relation to the former count of Southspear in the Old Kingdom says a great deal about how quickly things changed after the Mindwar ended. With miles upon miles of coastline to fish from and great deposits of diamonds and copper, Bralkast was one of the most likely regions on the continent to survive the political upheaval at the end of the war. Home to eight competing arcane universities before the Old Kingdom collapsed, these magic scholars descended on Countess Blain like a pack of wolves after decades of their most promising students being pressed into military service. Nobility fled this place soon after and from the ashes arose a thriving magocracy with free education for every citizen and magic training for those most suited to the academic lifestyle. Although as much of the bureaucratic and military infrastructure as possible was preserved, it has been a tumultuous six years as the new rulers (a council comprised of the headmasters of the seven surviving colleges) struggle to apply long careers of research to the real world of nation building. Rolling hills, tranquil forests, sparkling lakes and rich farmland once made Quigsby the iconic symbol of peace in the Old Kingdom. All of that still holds true but now a sovereign nation, Quigsby quietly groans under the pressure of decaying roads and lack of oversight from Blackstar. Orders of holy knights once patrolled this region as their sacred charge, citing Iomedae’s blessing over its idyllic landscape; but these knights need iron for their swords and shields and can barely scrape together the resources to maintain their presence in the area. The former Count Wesley holds court in Lakeside but in truth the farming, fishing and logging villages are generally left to feed and defend themselves. It is unclear what, if any response the leadership could muster if Quigsby faced a legitimate crisis. Dunhaven is a string of mining communities on the outer reaches of the Coldstone Mountains. Dwarven resistance and monstrous incursions prevented any settlements further west from surviving for long without constant military protection, which at the height of the Mindwar simply wasn’t feasible anymore. Since that war’s conclusion the Brightspear dwarves have made overtures of peace, lending aid and opening up new avenues of trade with their human neighbors. The political turmoil that rocked this region after the fall of the Old Kingdom and drove Countess Burdlow into exile has forced the Westwall Mining Co. (whose leadership seized power after the monarchy’s collapse) to take the dwarves up on their offer, though Boss Pascal openly talks of exploiting their neighbors for riches and territory at the earliest opportunity. The site of Protection Center 04 (and consequently the assassination of Martin the Blind), the shipyards of the Royal Navy and the epicenter of some of the fiercest fighting throughout the Mindwar, Northreach’s history is tainted by the acts committed there and the people responsible. Once an important port along the northern rim of Damark, the now infamous Shadowmere Towers (and the new capital of the sovereign Northreach) have been revealed in recent years to have been the last stop before exile to Frostfell for many political dissidents, minders and practically anyone else who resisted the Admiral. Admiral Bloodtide, as he has come to be called in recent years, has formally declared the Church of Asmodeus to be the state religion of Northreach. Curiously, psions face no open persecution under the Admiral’s watchful eye but the rabidly nationalistic populace, starved and fearful of their neighbors, still hate the minders and the Society of Freethinkers as a whole; even so, aggression against taxpaying citizens is fiercely punished no matter the cause, often with one or more bouts in “The Pits.” These gladiatorial arenas evolved out of underground, illegal prizefights into the state’s official sport, a move that does not sit well with the neighboring elves of the Grayleaf Forest. It should come as no surprise that Admiral Bloodtide and Archbishop Riyahl, The Devil’s Scourge, look hungrily to nearby provinces that have fallen into lawlessness and barbarism since the Mindwar concluded six years ago. The Brightspear clan calls this place home, residing deep beneath Firebelly Peak. An active volcano, the dwarves and gnomes of the Coldstone range have diverted the lava flow and bent it to their will: it is rumored that deep underground where one can find the roots of the world, the Brightspears have cultivated a new form of energy they grow in crystals incubated by the mountain’s fury. Torag’s Pact, the capital city and home to the only civilized dwarves on Damark is a bustling subterranean metropolis of over 40,000 souls. The mountain range is home, too, to many wild tribes of dwarves whose forefathers skirmished with the great goblin and orc hordes of old; these savage nomadic wanderers must contend with the elements, giants and the fierce gray elves patrolling the skies above the Coldstones. These griffon riders, led by the proud Mithral Heralds, occasionally clash with their stout neighbors but generally turn their eyes outward to the opportunistic, warlike humans. The elves and dwarves of the mountain range secretly work in concert to thwart any nearby human settlements that might one day pose a threat to their survival while lending aid to less fortunate neighbors who would otherwise be gobbled up by their competitors. In this way, by turning city against city and diverting attention away from the Coldstones, Dural Brightspear and Lord Cithrol of the Heralds hope to at least keep “the human problem” contained. Sprawling across Damark’s northeastern region, the Grayleaf is a mixed forest spanning multiple climate zones from the frigid north to the continent’s temperate center, almost all the way to the gates of Castle Blackstar. Wandering families of elves consider the forest to be alive and feel it is their birthright to patrol its borders and protect what is left of it from encroaching humans. Splendid ruins dot the verdant landscape under the ancient canopy, echoing a time when elven culture dominated this land in technology and magic. The restless dead, malicious Fey and stray outcasts from the time of the Great Schism (when the drow saw their chance to topple the old order and were banished for their treason) threaten the elves who still call this place home, and the complete lack of central leadership doesn’t make it any easier. Warm hills and savannahs dominate this wide stretch of wild space but in truth, the gnomes of various clans exiled long ago from the Coldstones for some ancient transgression have long resided here. Wilder and closer to nature than their kin in Moradin’s Pact, these gnomes are suspicious of outsiders (even the elves of the nearby Grayleaf) but generous to anyone in need of assistance. Their tunnels, valleys and mesas are heavily infested with kobolds and this constant state of guerrilla war keeps the gnomes’ numbers low. South of Haranshire, the Shrieken Mire spills out into the wide open floodplain called the Vast Marsh. This region is home to all manner of slimy beasts including lizardfolk and yuan-ti who, in millennia past, had a vibrant military culture that has fallen into ruin since their home became submerged. It is a little known fact that tribes of resourceful, courageous halflings have villages on stilts deep within the Marsh. The armored barges they use to navigate the continent’s rivers and wetlands are a solid defense against scaly predators that might have otherwise gobbled up the tiny folk long ago. Centaurs, orcs and barbaric humans vie for supremacy across this unspoiled paradise. Deemed untamable during the long line of royal succession during the Old Kingdom, the monarchs of that era decided instead to trade with the various tribes (human or otherwise) and try to buy their friendship. This worked, to a point, and great stone bridges were erected across the rivers dissecting the prairie which facilitated travel to Southspear (a province otherwise inaccessible except by crossing the Vast Marsh). Since the fall of the Old Kingdom, these bridges remain but outposts bristling with the spears and swords of the ruling families of Land’s End ensure they do not fall into the wrong hands. An impossibly vast desert dominates the western side of the continent. Its ancient, eroding sands are thankfully not a menace to the rest of Damark by virtue of the Coldstone Mountains, a veritable wall of stone. Legend speaks of a great civilization of giants before even the elves or dwarves developed written language that was swallowed under the sand; but the truth of these rumors can only be confirmed by braving the ruins now crawling with blue dragons, scorpions as big as houses and sentient, fiendish purple worms. Nine provinces once made up the Old Kingdom but only six and the old capital of Blackstar now remain. Economic instability; foreign raiders; political infighting; famines and other crises that might have been weathered had a standing army and central leadership been present all spelled doom for three counties that otherwise could have become sovereign nations in their own right. Territory around Bralkast, Dunhaven and Northreach was the most vulnerable after the king was slain six years ago, collapsing either from external pressure by aggressive neighbors or imploding under the weight of refugees fleeing other civil wars. The tribes of the Wild Plains, dwarves and gray elves from the Coldstone Mountains and the militant, greedy rulers of Dunhaven and Northreach all look with great interest on these areas, ripe for the taking. Spanning the southern coast between the Wild Plains and Bralkast, this region's western border was made up of a winding, convoluted network of canyons exposing rich silver deposits. This did not avail the good people of Karrvale after the end of the Mindwar, however, only prompting aggressive incursions by the philosopher kings of Bralkast to secure these resources. Revolution is expensive and Karrvale had what Bralkast needed. A consistent failure on the part of Count Borden to defend his people and their wealth led to his exile; it is believed he and his family perished at the hands of bandits while traveling north into Dunhaven. Today, the region consists of autonomous, walled city-states suspicious of outsiders; these are mostly run by gangs who take what they want from the populace but they are still safer than the world outside, and there is food to be had for those willing to work their fingers to the bone. There is plenty of good farmland outside these towns but no one left brave or competent enough to work and defend it. There are rumors of many former citizens being sold into slavery and shipped along the coast, around the Ocean of Fire to Northreach but this is probably wildly exaggerated. Running the length of the Coldstone Mountains from Dunhaven to Northreach, Skylar had access to more of the range's mining sites but many of these were deeper into dwarven territory than what Dunhaven has to offer. When the Old Kingdom fell the stout folk made a token show of force, thinking to scare the humans from their homes: it was wildly successful with many sites being abandoned outright and others left so underguarded by the civil unrest across the province they fell without much of a fight. Westwall Mining Co. lost much of its holdings in Skylar to the dwarves but because very few of the clashes were deadly, a surprising amount of the workforce and their equipment was salvaged before the region collapsed. Now that they have consolidated their strength, taken control of the local government and secured the sites they have left, Boss Pascal is eager to move back into Skylar and take back what is his. In the meantime, the locals have to deal with occasional dwarven and monstrous raids even outside the mountains as their enemies test the defenses for what must be more violence to come. Verral didn't stand much of a chance without the iron hand outstretched from Castle Blackstar to keep the peace. With a rapacious government in Northreach along the coast, calculating and opportunistic elves to the east and the completely unstable region of Skylar to the west and south, this area was destined to fall like a house of cards. It should come as no surprise that most of the 30,000 panicked refugees squeezing inside the walls of Blackstar come from these two former counties. Without much of a private military force to speak of, incompetent leadership still clinging to the old order in the hopes the insurrection was a passing movement and hostile neighbors on all borders, Verral as a coherent political state folded rather quickly but on the individual level life has not changed much in six years. Farmers still tend their crops, hunting and fishing villages thrive in the vacuum left by fleeing neighbors and a rudimentary militia is present in most settlements today, patrolling the borders and at least vigilant enough to warn locals of impending danger. It was a mixed blessing that Verral had very little worth defending or taking. So named for the visible brace on his right leg, rumors about that and his other injuries (as well as the questionable company he keeps) follow Garyld wherever he goes. Although he's spent most of his adult life in Haranshire, a great deal of his time is spent with other rangers and sylvan folk. At all hours of the night the lights are on at Garyld's boathouse as strange visitors come calling with this or that new bit of information from outside. Many residents of Milborne wonder how someone with an obvious disability ever had the occasion to travel and meet so many different people; their neighbor is widely respected and even serves as the town's constable but the "queer folk" around him keep the rumor mill in business. There are a handful of services someone with Garyld's abilities can provide to friends and paying customers. As a retired ranger, he knows Haranshire's waterways better than anyone. The network of rangers and druids who have always watched over this idyllic countryside is not what it used to be, but nevertheless what remains is organized mostly out of Garyld's boathouse; so if a message must be delivered to any corner of Haranshire or outside it, he is the man to see. Finally, he and Capella are expert carpenters and Garyld, in particular, is a fine bowyer. In Blackstar, crime festers. There are too many people in too small a space for illicit activity to be accurately monitored or controlled by the authorities. In this environment the Crown is thankful that there is one man on the streets, at least, who can be trusted to keep violence to a minimum and conduct his business away from the public eye. Gordrenn is a public figure in Castle Blackstar. He has never sought public office and is not of noble blood but nevertheless commands a great deal of respect from business owners, government officials and common people alike. The reason for this is twofold: first, his service to the community is unparalleled in the private sector with money being loaned at no interest to struggling merchants and food and shelter being offered to the needy. Second, it is understood by the locals and the establishment, but never said aloud that Gordrenn is in fact the head of a vast and powerful criminal network. During the Mindwar, Gordrenn smuggled supplies into and refugees out of particularly hard hit regions, always staying one step ahead of the Crown's men. The "Street King's" heart lies with the people and wherever they suffer, he is there to lend whatever aid he can (sometimes at great personal and financial risk). His activities were tolerated even then because Gordrenn does not play favorites: countless loyalists and Freethinkers alike were spared a tragic end by Gordrenn's charity. Some may disagree with his methods and certainly there is no shortage of questions about the man's business interests, but no one can speak ill of his character. Today, it is entrepeneurs like Gordrenn who keep the wheels of business and politics turning. Without troops on both sides patrolling the roads and keeping lines of communication open between settlements, Damark is no longer safe for most travelers. Caravans with the kind of muscle only the "Street King" can provide ensure the continent does not slip into another dark age of brutal conflict and isolation. In his mid twenties, the man locals know as "Ol' Kuip" is rapidly supplanting Garyld as Haranshire's resident tracker and outdoorsman. He offers hospitality to any well-mannered travelers on the road between Milborne and Thurmaster, with a seat at his table and plenty of room at his spacious farmhouse on the Churnett. Horses, livestock and a hive of giant bees are maintained there and Kuiper's hired help does a bit of farming as well. Kuiper is not a scholar. Far from it: he trains his mind diligently to be able to recall the information at his fingertips about the natural world and its hidden paths and trails. He is the sort of ranger who can take you where you want to go by the shortest, simplest path, foregoing any proficiency as a stealthy hunter or keen-eyed scout. Any trouble he encounters in the wild is met with brute force, as he is armed and ready to address even supernatural threats (cold iron and silvered weapons are common additions to his gear on the road). Kuiper is a friendly, kind-hearted man with simple interests and an eagerness to help those who can't help themselves. But anyone seeking to really gain his trust has a harder road ahead of them, and those who succeed can readily call on the aid of the likes of Garyld, Tauster and other locals who swear by the ranger's honor. Oleanne is not the first druid to make her home in Haranshire. The locals have a long and usually fond memory of druids and rangers lending a hand to protect this area from the perils of the outside world; although most of these individuals are now dead, Garyld and Kuiper are still going strong, and deep within the Thornwood lurks the so-called "Wild Woman of the Woods." Raised by the same wolf pack that accompanies her everywhere today, Oleanne is in her early 20s and is the successor to Haranshire's previous steward, Darlen. The locals hate and fear Oleanne for her fondness of wolves (a tradition of superstitious loathing that dates back to the "Bitewinter") but often overlook the times when a child has gone missing and been returned safely, obviously by Oleanne; or when someone has received a drubbing on the road or endured some calamity in the wilderness, only to awaken with his wounds mended with cobwebs, mint leaves and myriad strange herbs. Shiraz is the third ranger of Haranshire and one of only four remaining members of the Sylvan Circle. She is in her mid-40's, perhaps a bit younger than Garyld but certainly old enough to be Kuiper's mother (although none would dare say that to her face). Shiraz is very fond of all birds of prey but if the majority of locals know she is in fact a were-eagle, they make no mention of it in idle conversation. This trait more than any other facilitates her ability to move undetected and unrestricted across the length and breadth of Haranshire, favoring out-of-the-way locales most natives have no knowledge of. It is rumored that the shapeshifter is familiar and on good terms with many Fey creatures native to the region. Shiraz is very close with Garyld. She and Oleanne clash, mostly because of the stubborn, standoffish demeanor they have in common. Kuiper is a little too jovial for her liking but she respects his stout arm and enthusiasm for good deeds. As far as other adventurers are concerned, Shiraz does not suffer fools nor those who tarry in defense of Haranshire, her sacred charge. Her full wrath is reserved for those who actively seek to disrupt the natural order or do harm to avian creatures. Decades ago, before the Mindwar came to its bloody, fruitless end, Tauster fled the province of Bralkast. Some disagreement, the nature of which is known to very few, between him and his guildmaster sent the fledgling mage running for the hills. The backwater hovel of Thurmaster was not such a hovel back then but it was remote enough Tauster needn't ever fear discovery by his former instructors or colleagues. In short order, the lizardfolk of Shrieken Mire emerged in great numbers from the swamp and fell on Thurmaster in a bloody tide, killing or dragging off many locals. The town might have been completely destroyed were it not for Tauster's fireballs and lightning bolts. Today, these many-colored spectacles serve only as fanciful entertainment for those too young to remember the tragedy. Still, the people of Thurmaster are grateful to have a resident wizard. Evocation is no longer Tauster's cup of tea. Instead, the old codger now specializes in magic that produces practical items and enchantments to tackle problems thwarting the common man. These items and others might prove useful to an adventuring party, particularly one that can find their way into Tauster's good graces. It also helps that he is the closest thing to a celebrity Haranshire has to offer, and is thus well situated to put in a good word for anyone who wants an audience with Count Parlfray. Alvor & Darren: Cousins, one a fiddler and the other an accomplished singer. They do odd jobs around the farm at Kuiper's homestead. Andren: Cook at the Baron of Mutton. Brother to Barthelew, grandson of Dirkaster. Engaged to marry Jelenneth, who was abducted from Milborne. Left town for Blackstar. Arlin & Belsha: Mated wolves, both alphas of their former pack, adopted as companions to Oleanne, the Wild Woman of the Woods. Balford & Bill: Peasants, residents of Harlaton in Haranshire. Grateful for their salvation from Carlanis' banditry. Barranas: Formerly the owner and operator of the general store in Thurmaster, currently a refugee in Milborne. Dabbles in alchemy. Barthelew: Innkeeper and head cook at the Baron of Mutton. Brother to Andren, grandson of Dirkaster. Widely considered the master of gossip in Milborne. Capella: Carpenter in Milborne. Moonlights as executioner. Not-so-secret lover of Garyld the Lame. Carlanis: Bandit leader. Murdered Deventer the paladin when the party first arrived in Haranshire. Addicted to fishy oil and underwent transformation into some kind of seamonster. Died while in Garyld's custody. Captain Greyholme: Captain in Count Parlfray's Palace Guard. Highest-ranking soldier in Haranshire. Shares mutual trust with the heroes, and mutual dislike of Mayor Carman. DECEASED. Carman: Darius Carman, patriarch of wealthy, landed noble family and mayor of Milborne. One of the leading traders in the Exchange, Milborne's financial hub. Lost family to bandits on the road to Blackstar. Cattea Demore: A minder, seemingly the only survivor of a derelict barge run aground during a recent thunderstorm. Her traveling companions missing, she threw in with the Heroes of Haranshire for a few days until deciding to pledge herself to Lady Oleanne of the Thornwood and the Sylvan Circle. Dirkaster: Patriarch of the Mutton clan. Proprietor (in name) of the Baron of Mutton. Local legend due to his advanced age. Grandfather of Andren and Barthelew. Duncan: Would-be highway robber, taken prisoner along with Carlanis after their failed ambush of the party. Now works off his debt to society on Kuiper's farm. Local to southern Haranshire, now plagued with flooding. DECEASED. G'haz-kuhl: Dissident acolyte of the Bloodskull orcs. Challenger to Chieftain Garundzen's throne and eager to supplant him by staging a coup and replacing him with Thunk. Grizzler: Crazy old dwarf in Milborne. Spends most of his time at the Silver Crown tavern. Spent years as a prospector in the mines of the Blanryde Hills. Rumored by local children to hoard massive troves of gold and jewels under the floorboards of his home. Grubu: The sole survivor of a goblin tribe native to the Blanryde Hills. His people were slain by bandits hiding out in the Garlstone Mine. Not a 12th level fighter. Haldelar: Miller in Milborne. Married to Parella, father to Jelenneth. Carries the keys to the Old Granary. Represents the common people of Milborne in disputes with the Carman family or the Parlfray clan. Harry Denfast: 9-year-old boy, refugee from western Patchwork Hills. Now resides with his uncle in the Terraces. Witnessed goblin activity on his father's farm before relocating and served the heroes as guide to his old home and the headwaters of the Cutter Brook. Issha: Shieldmaiden of the Order of the Phoenix. Visited Haranshire to recover Deventer’s remains from the Hall of Heroes in Milborne, but was denied by Semheis. Kirkuk: Eldest guardian of an exiled kobold clan, residing along the Hog Brook within northern Thornwood. The Blunt Knives were driven away from the court of the Queen of the Mire. Taught the party about far'ja mushrooms. Kurt: Teenage son of Krynen, Kuiper's neighbor on the next farm over along the river. Confirmed werebear who just survived his first change and was rescued at the Reflecting Pool by the Heroes. It is assumed the Sylvan Circle is already watching his progress carefully. Lyntern: Less than 20 winters old, the now-blind young Lyntern Parlfray is officially the last of his name and the current Count of Haranshire. He watched his father die and return, in unlife, as a ghoul before devouring Squire Marlen alive; and thus was driven to gouge out his own eyes in grief and despair. It is unlikely he will fully recover mentally or emotionally from the ordeal or his captivity at the hands of Gideon and the Ninth Legionnaires who imprisoned him in his own Keep. Nafton: Stablemaster in Milborne. Also trains and sells hunting and riding dogs. Neeka & Osaka: Twin girls, servants to Gordrenn "Street King" in Castle Blackstar. Dark-skinned descendents of natives from the Ocean of Fire. Parella: Baker in Milborne. Married to Haldelar, mother to Jelenneth. Operator of the most impressive stone ovens in Haranshire. Told the party about the original home of the Parlfray clan, deep in the Thornwood. Pavi: Live-in butler to the Carman family at the mayoral estate on the edge of town. Aged but fit and of sharp mind. Has seen two generations of Carman patriarchs come and go. Phoenix Guard: Also known as the Order of the Phoenix. A cavalier, two paladins and an inquisitor ride with Issha in pursuit of vampires and their spawn. Their names are Myrdan, Phineas, and twins Weyland and Kara. Rastifer: Terrifying old proprietor of the general store in Milborne. Blind and possessed of unnatural bad breath, but still boasts the best prices in town. Semeren & Walright: Journeymen at Carman Smithy. Accomplished armorers and weaponsmiths. Responsible for equipping the Milborne Militia. Semheis: Resident cleric of Sarenrae at the Temple of Milborne. Expert healer and scholar of religious archaeology. Unwilling to use Pelor's magic to heal evil characters or creatures. Singefur: Large female worg and leader of her pack. Currently resides in the western Patchwork Hills. Has relations with the goblinoids who have recently relocated there but is at odds with their leadership. Weismar: Vaguely unsettling proprietor of the deplorable Hound & Tails in Thurmaster. Beholden to Tauster to offer special rates and amenities to the wizard's associates. DECEASED. While we may occasionally reference other calendars, for the purposes of this campaign we will use the human perspective for counting the years. The Mindwar ended in the 406th Royal Year (RY); though the kingdom's stranglehold on the continent has shattered, Queen Issra II yet lives and the six free nations of Damark consider it expedient to continue using that system to measure the passage of time. Thus, the campaign begins early in Ebb, the fourth month, of 412 RY. This calendar began with the initial conquest of all human lands under Queen Gabriella I. Prior to that time settlements were far-flung and constantly at odds with their neighbors. With all men united under one banner, great advances in civilian and military magic, medicine and technology were established, as well as the churches to the great deities as we know them today. For some real-world perspective, consider the difference between life in Europe prior to Roman conquest and what the continent looked like before the empire finally crumbled in 410 CE. Each regular year is made up of twelve months of thirty days each. Every month is separated into three weeks, with each lasting ten days; this extends to any game mechanics where the length of a week is relevant (so if a spell had a duration of one week per level, it would effectively last ten days per level). Every three months another, separate day is counted as a special holiday. Newdawn falls between Feron and Ebb (the third and fourth months) and traditionally marks the beginning of spring (though cynics are quick to observe given the events of the past century, it is probably more accurate to describe Newdawn as a reprieve from oppressive winter). Particularly in regions like Northreach and between the foreboding prison citadels and observation outposts of the Frostfell, Newdawn (when weather permits) is right around the first time of the year when communities isolated by the deep freeze in previous months can renew their bonds. All over Damark this sentiment trickles down to relationships between families and individuals, making Newdawn a time for warm, if subdued, celebrations. Given another holy day's significance for newlyweds nine months prior, Newdawn is often celebrated as a time for many communities to meet their newest young neighbors. Midway is a time for romance, marking the day between Baro and Ondo (the sixth and seventh months). The warmest, most moderate temperatures are felt around this time in the northernmost reaches of Damark and in places like Bralkast, Southspear and the Wild Plains, Midway is observed during thick, hot summer. The churches of Erastil, Iomedae and Shelyn marry many young couples on Midway. Wiltgreen and the week leading up to it are widely considered the proper time to take in the annual harvest and hold wild celebrations, and is observed between Rav and Midd (the eighth and ninth months of the year, respectively). Although for many people Wiltgreen is a happy occasion it is also the beginning of winter, so these wild parties are sometimes a poignant farewell to neighbors one might not see again until the spring thaw. Deadheart broods in the dark, howling winter. The last day of the year, it is a time for silent reflection on the past twelve months and also the proper occasion for families to privately mourn the dead. Though communities across Damark have their own funereal customs and it is common for some kind of ceremony to follow a death promptly, Deadheart is the traditional day of grieving for all those lost during the year. Deities like Zon-Kuthon and Norgorber consider Deadheart an ideal time for black deeds, the swearing of dark oaths and other mischief. Cults dedicated to Urgathoa, Lamashtu and Rovagug all similarly indulge in their foul work on this profane occasion, while the Temple of Pharasma in Newport (the capital of Bralkast) marks it as a time for respectful celebration of the departed souls' transit to the Great Beyond. A fifth holiday, Freeday, "floats" around the calendar from year to year. Every twelve months Freeday is marked following one of the four "regular" holidays, so while in 1 RY Freeday fell after Deadheart and before the first day of Onemonth, in 2 RY the holiday was observed alongside Newdawn. In common parlance, it is customary to refer to years by the name of the holiday extended with the Freeday (so, if Freeday joins with Midway, that is called a "Midway Year"). Freeday is what it sounds like: it is an extension of whatever holiday it accompanies that particular year. Astrologists and other spiritualists consider Freeday portentious for various events, depending on which day it follows (a year in which Freeday will fall after Wiltgreen is prophesied as a time of great bounty, while Deadheart Years are seen variously as times of great loss or great change). Finally, every four years Lostsun follows the Freeday after Deadheart as the 366th day of the year. There is no conventional view of this special day: the evil religions consider it one more day in the heart of winter to ply their grim trades, which would ordinarily mark it as a day of fear for the wide populace but the church of Sarenrae begs to differ. Historians recall we have Sarenrae's faithful to thank for the Royal Count, as it was Gabriella I's royal advisor, Petral the Lame (also known in that time as the Sunseer and gravely wounded in his lady's battle for dominance of Damark) who invented it. Lostsun is considered a blessing by devotees as one more day of the year for them to raise their voices in thanks to the Radiant Mother, though nature may conceal the sun from their sight. 412 RY, the current year (and a Deadheart Year), includes a Lostsun. Blanryde Hills: These limestone hills are fairly barren, with only some patches of poor grass surviving here and there on their slopes. Wild goats can barely eke out a scarce living here, let alone shepherds and their flocks. The hills contain lead and copper deposits, though, and the mines north of Milborne have been an important factor in the local economy for over a hundred years. Few monsters have ever been sighted here – while there are plenty of caves to lair in, there is little for them to live in other than the fish of the Eelhold (guarded jealously, until recently, by Shenjurath’s bound elemental). Carman Mines - Several dozen miners work in either mine, with a small shantytown of rickety wooden cabins outside both. There has never been any trouble at either location of the sort that closed Garlstone Mine. The men and women who work here are suspicious of strangers snooping about and anyone interested in taking a look inside had better have a good reason for wanting to do so. The Slug - This is what old miners call the underground channel dug out to drain industrial run-off from the mines into the Churnett River. It took several years to excavate the tunnel, which is some eight feet in diameter. Leakage of heavily ore-tainted waters over many decades has poisoned the ground above so that the grass growing overhead is yellow and rank, and the affected soil is wholly unsuitable for any agriculture. At its point of origin in the hills the Slug lies nearly 150’ below the earth’s surface, but the land slopes downhill toward the river so where it empties into the Churnett, the tunnel is just beneath your feet. Eelhold – Many generations ago, during the Golden Age of Damark’s royal line, this dam and its related fortifications were constructed not only to regulate the flow of Haranshire’s waterways but also to protect a secret: a Gate to the elemental Plane of Water. The Heroes sealed the Gate with the help of a resident nixie Shenjurath and banished a rogue water elemental back to its home. Although this ensured the structural integrity of the dam itself for years to come, if local humanoids learn of the spirit’s departure the artificial lake might attract unwanted attention. The people of Milborne rely on the population of giant eel here for seasonal sustenance. RUMOR: A small family-group of ogres makes their lair here. When they can spare it, they take pains to leave food out for the goats sometimes spotted grazing on the slopes. Nobody has ever seen an ogre within ten miles of either of Carman’s active mines, and there have never been any reports of missing persons, so the miners are content to let the matter rest. Closer to the Eelhold, however, late at night when they are most active, those eager to wander around in the dark should take care lest they become the giants’ next meal. Lyrchwood: This forest produces the highest yield of quality timber in the region and is thus heavily logged. There are many areas now completely denuded of mature trees, with small groups of two to five huts of lumberjacks and their kin nestled everywhere within the wood. Although there isn’t much by way of monstrous or evil humanoid activity here, it is relatively easy for bandits to blend in with the local population (as the Heroes learned the hard way when they first arrived). The only real concern is a feral pack of dogs that runs loose in the area. They are not believed to be rabid, but the woodsmen know not to travel alone. RUMOR: The alpha male of the dog pack isn’t a dog at all, but a polymorphed man. As the story goes, twelve winters ago a local drunkard named Caden, notorious for treatment of his wife and son, went missing after a particularly nasty row with the missus. Larissa, however, dabbles in the dark arts, and had finally had enough: she cursed her husband’s form to reflect his true nature. She left soon after with her son for parts unknown, but the boy (also named Caden) returned just last year. Now a grown man, he lives in Harlaton and refuses to speak about either his father’s disappearance or where Larissa lives now. Patchwork Hills: The origin of this place’s name is clear during the fall season, when the heather and bracken coating the slopes appear mottled like an irregular, patchy quilt. During this time, when the wind blows down out of the north and if the weather is favorable, locals burn away the bracken to protect the crops grown in the Terraces. Many of Milborne’s elite live here or at least maintain summer estates in the region. Terraces: Nearly a hundred years ago, great steps were carved in the hillsides here facing north toward Harlaton and Milborne. Each terrace is approximately fifty yards wide with the next step lying 20-40’ below, accessible by stairs cut into the rock. The soil here is surprisingly good and favors roots and leafy greens. Ownership of a terrace is handed down within families and jealously prized. Harlaton: Nearly a hundred people make their home in or near this cozy farming community nestled among the best farmland in the area. The Pitcher & Pitchfork is the center of public life here, where all farmers come for a drink or three after (or before) a hard day’s work. The main topic of conversation here vacillates between the latest Drunken Horseshoes champion and the recent occurrence of the New Mire, and what is happening there, and why doesn’t Darius Carman do something about it. New Mire: Two years ago, this was all good farmland. Then the soil became waterlogged although the Cutter Brook had not overrun its banks, and this year the affected area has doubled in size and in some places the water is over a foot deep. Many families have been forced to abandon their homes and many more linger on, though they have been reduced to buying feed to sustain their draft animals and livestock. RUMOR: Hunting spiders as big as a man stalk the Patchwork Hills. One, in particular, is far larger and more cunning than the rest. The legend tells of a half-elven druid who roamed these lands long ago and was transformed by a mad wizard whose plots she foiled one too many times. She is remembered now only as Erastil’s Child and it is said that showing the beast her reflection to remind her of her past life can distract her long enough for her prey to escape. 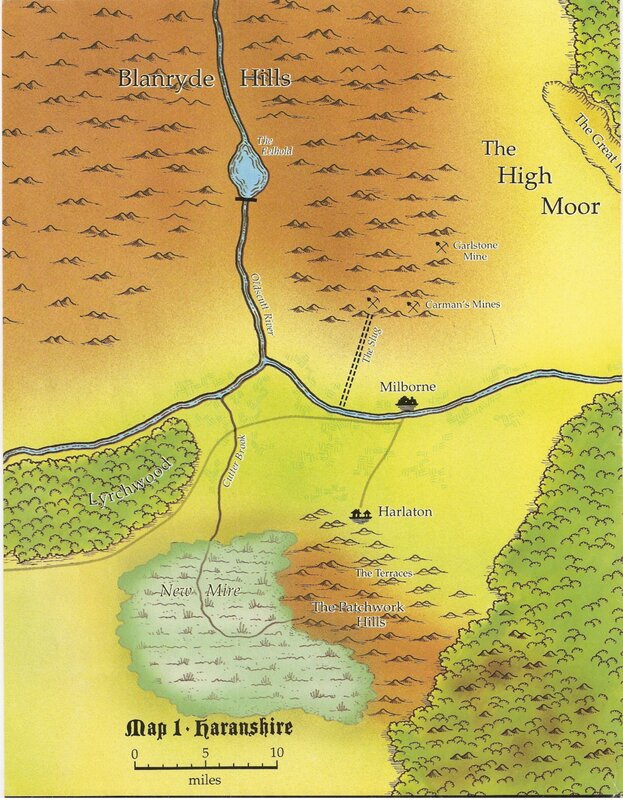 High Moor: The land here is as poor as that on Howler’s Moor; but because it is at least nearer to the safety of Milborne and the farms north of there, some hardy folk take sheep or goats to graze here. The eastern half of the moor is very rocky and barren, especially where it borders on the Great Rock Dale. The danger of evil humanoids foraging on the High Moor leads even the bravest shepherds to give that region a wide berth. RUMOR: Three years ago, two young lovers dallied here at night and were caught out in a summer storm. They were in enough trouble as it is, having had to ride out the storm for longer than they would have liked to be away from home, and likely would have concocted some other story had they not encountered a strange, naked man. He didn’t appear to remember know who he was or have any idea how he got there, except that he was certain he had been somewhere else before the storm. The pair escorted him back to town, where some of the locals recognized him as one of the seasonal laborers who came to work in Carman’s mines. He had been missing for over a month after disappearing during a similar storm while taking the Churnett River east to Thurmaster. Great Rock Dale: This gorge descends 100-180’ nearly straight down, depending on where you try to make your way down. Scrub trees and bushes grow along the canyon floor and here and there on the walls. There are many caves and rock formations within the Dale, and rainfall pools in its deepest recesses to make up the majority of its potable water. Gnolls, goblinoids, ogres and orcs make lairs here, and almost all of them are constantly at war with everyone else. RUMOR: The Rosestone is an ancient relic dedicated to Sarenrae. Legends speak of a prehistoric cult of sun-worshippers that used the obelisk as a focus for their prayers and religious ceremonies. It is believed to be anywhere between eight and fifteen feet tall, over five feet around and consists entirely of a single chunk of quartz rock. The priest at the temple in Milborne, Semheis, believes it to be buried somewhere in the Great Rock Dale and desperately wants to reclaim the artifact for his church. Hardlow Woods: This dense woodland is packed with ground-hugging thorny bushes that makes the terrain virtually impassable in most places. There are also small, craggy rifts up to 40’ deep in the westernmost reaches of the forest, making travel hazardous. A small pack of winter wolves make their lair here and do not emerge from under its protective boughs until late in the year except at night, and only then into the Great Rock Dale to prey on the warring clans of humanoids there. RUMOR: More than wolves keep the locals at bay. Legends speak of a mad circus performer who long ago used prestidigitation, comic relief and the promise of treats to lure children from their beds at night to their deaths. Nobody knows for certain what became of the boys and girls but their parents eventually rallied together to drive the villain from town. Their posse chased him to the Hardlow Woods, where they were met by the Count’s own guards. Knights and villagers banded together to follow the predator into the forest, never to be seen again. It is said the Dead Jester, as he is known in these parts, laid a fell curse on the vigilantes who cornered him here and that their fate is far darker than whatever happened to their children. Howler’s Moor: This desolate, barren place offers meager grazing for sheep or goats, but in summer months shepherds venture here nonetheless. It takes its name from the howling wind that races across the plain and also from the various legends about werewolves, a huge, black dog, and worse things that stalk the night here. Because it is so geographically remote and has such a sinister reputation, anyone up to no good can likely get away with it without fear of being discovered. RUMOR: The Black Beast of Howler’s Moor is real. At least, the locals seem to think so. This is really the only example from all the tall tales the region has to offer that every single person you meet will swear is true. It is clouded in a smoky miasma, breathes fire, is the size of a horse and can outrun one over open ground. Nobody alive today can identify a single person who claims to have witnessed the hound firsthand, but this is merely shrugged away as further proof that the stories are true. After all, if so few people have seen it and lived to tell the tale, the Black Beast must be ferocious indeed! Thornwood: Unlike the Blessed Wood, cleared of orcs a generation ago by order of Count Parlfray and now home to some of the choicest lumber in Haranshire; and the Redwood, where logging is banned but where apples and many kinds of edible berries grow wild and are picked during the summer months; the Thornwood is largely avoided by locals. It is ancient and foreboding, reminiscent of every haunted forest in any story ever told. Evil humanoids, giant spiders and a host of other deterrents keep woodsmen from plying their trade here. Hog Brook: The gnarled, twisted scrub oaks that grow along this stream’s banks drop an impressive bounty of acorns in the fall. Local pig farmers lead their swine here to feast, particularly in late fall before the first snow, but it sees plenty of traffic year-round. Many pigs have escaped over the years and only the first five miles or so are safe for any but the hardiest of folk. Thankfully, the local Razorback population is heavily regulated by the numerous predators of the Thornwood; however, this only means that those wild boars that reach adulthood are the craftiest and most ferocious. The Hog Brook terminates at a place the Sylvan Circle calls the Reflecting Pool, where the Heroes of Haranshire first met Oleanne, the so-called Wild Woman of the Woods. Featherfall: In the midst of where the western Thornwood overlaps with the Patchwork Hills is a tall rock ledge that plunges straight down nearly 300’ into the canopy. The northern face of the escarpment features a long rockslide that, in the right light, appears to lend a feathery striation to the stone (hence the name). When she isn’t at the Eelhold this is where Shiraz the ranger spends most of her time. It is believed she is the go-between for the people of Haranshire and a strange race of bird-men who make their home at Featherfall, but this is one of the most impossibly remote regions in the area and nobody knows anything about it for certain. RUMOR: Nobody has ever seen more than one grizzly stalking these woods together at any given time. The rangers who patrol these lands refer to the supposedly solitary creature as Father Bear, and are careful to keep track of its movements and where it chooses to make its lair. It is readily identifiable by the damage to its lower jaw, where a hapless woodcutter desperate to drive the beast away from his wife and child buried his axe in its face. This would be a thrilling enough story, but it gets even more interesting: Dirkaster, the nearly-hundred-year-old proprieter of the Baron of Mutton in Milborne, first heard the tale as a small boy whose father insisted he first heard it as a boy, as well. If Father Bear is indeed the same bear, he is at least 150 years old, and likely no bear at all. Shrieken Mire: This extensive marshland’s namesake is Lord Artran Shrieken, whose family fell into disfavor in the royal court after he tried to force one of the young Parlfray women to marry him. She fled into the mire with her lover, pursued by Shrieken, and the three supposedly met their watery end in the bogs on a misty, moonless night. This story is enough to discourage people to poke around here, fearful of Shrieken’s Curse; but the venomous snakes, countless stinging and biting insects and treacherous footing all do their part as well. Supposedly, lizardfolk and other reptilian humanoids lurk in the swamp as well, but it has been decades since anyone saw their kind. RUMOR: The Queen of the Mire is a tale dating back several generations. As the story goes, there is some kind of ancient being; perhaps a witch or hag, or something of Fey origin, or some other kind of supernatural being with a power over the minds of men; who makes her home deep in the swamp, away from the prying eyes of the civilized world. Nothing that happens outside Shrieken Mire has ever been attributed to the meddling of this creature, whatever she is (all the stories, from the very beginning, identify her as female). It also bears mentioning that none of the locals really have any idea what goes on inside Shrieken Mire. Nonetheless, people here believe there is a Queen and that she can bend you to her will with but a thought. Count Parlfray and the Sylvan Circle don’t necessarily encourage such wild talk, but the marsh is a very dangerous place, and it is probably for the best that the locals have one more reason to avoid it. Halfcut Hills: Legends tell of a time before men, before the Elder Races or even the quasi-mythical war between giants and wyrms, when gods and goddesses stalked the world. They did battle with each other here before thinking creatures moved across its surface, and it is here that Rovagug nearly cleaved Irori in two with his axe. The hills have very sheer sides reaching nearly 350’ in some areas, with the cliff faces revealing all manner of fossilized shellfish and crustaceans. The hills themselves are barren and lifeless but great eagles nest here atop their peaks and venture far afield in search of prey. Parlfray Keep: This is the seat of local power within the borders of Haranshire. Count Sandior Parlfray and his only heir, Lyntern, are the only nobles in Damark who still swear fealty to the Crown of Blackstar. They do not have much of a standing army to speak of, with the keep’s garrison hovering around fifty souls; and the taxes collected here go toward public safety in Haranshire, which is a daunting enough proposition that not one copper is left over for the young girl who now sits on the throne. They are members of her court in name only, with Count Parlfray instead serving as the de facto sovereign ruler over these lands. There has always been a Parlfray tending the flock of Haranshire, and as far as the locals are concerned, there always will be. RUMOR: Strange lights can be seen over the Halfcut Hills on dark, moonless nights. The green and blue twinkling motes might be mistaken for stars except that they seem far too close, since they are only visible to those in the immediate vicinity of the Keep. When the moon is full, however, shimmering pink and yellow ribbons appear and are sometimes close enough to the ground to actually illuminate the hilltops in the area. If Lord Parlfray knows what they mean, he isn’t saying. As explained previously, the calendar consists of twelve months numbering thirty days each. These days are grouped into three ten-day weeks. The months and the origins of their names are as follows. Sarn is the first month of the year and follows Deadheart. With much of Damark still in the grips of winter's chiil, it is a quiet time at home with family while provisions dwindle and the days start to lengthen again. Sarn is the name of the hamlet where Queen Gabriella I was born, somewhere in what was once Verral. It was a fishing village, but a civil engineering project in the reign of her grandson, Gabriel I, dammed the river flowing out of the lake where Sarn was founded and the place was flooded out. Windal falls between Sarn and Feron and ultimately marks the end of winter in terms of climate even if Newdawn is the official, symbolic beginning of spring. Windal was Gabriella I's uncle, a questing knight sworn to the service of the newborn Church of Saranrae at that time. It was under his tutelage that she met Petral the Sunseer and it was Windal's death that galvanized her resolve to consolidate rule under a single banner. The first day of spring technically falls somewhere in the month of Feron and Newdawn, the holiday that follows, is the holiday set aside for official observances related to the changing season. Feronil is the name of an angel who pledged her banner to Sarenrae in the holy war against Rovagug, the Eater of Worlds. Although the historical record of Gabriella I's lineage leaves much to be desired, one popular folktale is that her Feronil was her grandmother. Ebb follows Newdawn. The campaign began on the sixth day of Ebb, and it is a time of warming temperatures, thunderstorms rolling over the countryside and a general flowering of all things. Ebb'in Shadiq-Mal, a storied warlord whose nomadic tribe rode the wastes of the Ocean of Fire, founded a previous incarnation of the secretive cabal known today as the Brotherhood of Secret Fire. Shadiq-Mal was a contemporary of Gabriella I and even an adventuring companion of hers, for a time, before his dispute of her claim over territory beyond the Ocean of Fire led to crossed swords. Qaden, the fifth month of the year, is named for Lord Qaden. He was a generation older than the first Queen of Damark and had her uncle Windal assassinated to deter her from her crusade to unite the kingdom. When war between the two was inevitable, a winter campaign under the boughs of the Grayleaf Forest sealed Qaden's fate and helped clear the path for Gabriella's coronation. Baro is the last month before summer. Barrowdale is an older name for the region that became Northreach and was where Ynnir's Reavers made landfall, nearly ending the war before it began as all sides suspended hostilities to repel the giants from Frostfell. The holiday between Baro and Ondo is Midway. This time of year is among the most sacred for the Church of Sarenrae. Petral the Lame, otherwise known as the Sunseer, had an orcish father. Undur-zull was his clan name, but Petral is by far the most famous man or woman of that bloodline. There is no evidence to suggest the clan exists at all, though if they do, they can be found today in the foothills between Dunhaven and the Coldstone Mountains. Ynn is the eighth month of the year, marking a tipping point between summer and fall. It is named for Ynnir of the pirates known as Ynnir's Raiders, ogres out of Frostfell who made landfall in what is now Northreach. Ynnir, their frost giant chieftain, burned and pillaged his way down the Casheen until Gabriella and Ebb'in slew him and the white wyrm he rode on. The dragon's skull is still a badge of office for any would-be chieftain who would rally the tribes of the Ocean of Fire under one banner. Rav precedes the holiday of Wiltgreen, though on years when the harvest is particularly bountiful (usually Wiltgreen years) the entire ninth month is given to wild revels. Gabriella, Ebb'in and Petral rode with a satyr by this name, and it is he who both mended the half-orc's leg as well as could be managed and oversaw the first Queen of Damark's vision quest which set her on the path to the throne. Midd is the beginning of the end for autumn. It is so named for Midd'eth'el, mother to Cithrol of the Mithral Heralds in the peaks of the Coldstone Mountains, who fought with her woodland brethren to stop Lord Qaden's advance. It is believed she claimed Qaden's eyes after besting him in single combat, but she did not kill him; leaving him to wander alone in the dark until nature took its course. The eleventh month of the year, Strym'byn'eth'ell lent his name here. A chance tryst with Midd'eth'el, the Mithral Queen of the Coldstones, led to the conception of Lord Cithrol, who carries her banner still. Likewise, Strym'byn'eth'ell yet lives, though his rule over the elves of the Grayleaf Forest is far less centralized. The Green King, as human minstrels know him, repelled incursions on all sides during Gabriella I's war of unification. Narn, the twelfth month, precedes Deadheart (and, in the year 412, Lostsun). This is the heart of winter and is sacred to those who worship death and darker philosophies. Narn was the name of a minotaur chieftain, half-fiendish according to Petral's firsthand account; at that time, minotaurs roamed unchecked over the Wild Plains. Narn claimed his father was none other than Norgorber, the god of secrets and murder, and that it was foretold he would butcher the would-be Queen of Fire and Light to herald not three hundred years of peace, as Petral foretold, but a thousand of darkness. As the legend goes, Gabriella grappled with Norn as he urged his powerful demonic wings to bear them both higher and higher into the air, finally gaining the upper hand and forcing him back to the ground. They both perished but Gabriella was born again, confirming a key aspect of the Sunseer's prophecy and signaling to the stragglers who still contested her right to rule to lay down their arms.